barbarian traditions to influence the medieval artistic expression. The Christians differed from the religious sects of the Jewish people - the Sadducees, the Pharisees, the Essenes, and the Qumran community -in three ways. Firstly they believed that the Scriptures were completed with the coming of the Messiah. Secondly they accepted women as participants in common prayer. Thirdly they followed the policy of attempting to convert Gentiles. 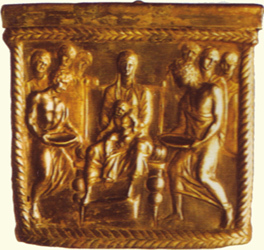 Within the multicultural arena of the Roman Empire, they found points of reference with other religious beliefs: the monotheism of the Stoics, who believed in the spiritual majesty of the Greek God Zeus; the individual salvation promised by the mysteries of Demeter and Dionvsus, whose symbols - ears of corn and wine - came to indicate the bread and wine of the Eucharist; the cult of Isis (a similar figure to Mary), the mother who offers comfort, represented on her throne with the young Harpocrates; and spiritual motifs in Orphic and Pythagorean practices. It was to take centuries, however, before this adaptable religion found favour in a wider realm. The sepulchre of Antiochus I of Commagene (34bc) on the peak of Nemrud Dagh in Turkey depicts the Persian god Mithras with Greek and Hindu divinities. The meeting of these cultures gave birth to an elaborate initiation rite that established itself in the imperial age. It tied in well with the Syrian cult of the Sun God, which the emperor Aurelian had assumed as the official state religion, inaugurating the grandiose Temple of the Unconquered Sun on the Quirinal (ad274), one of the seven hills of Rome. 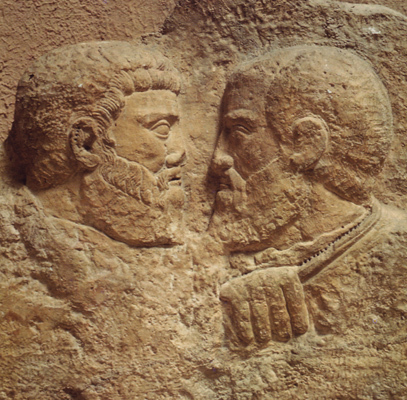 Diocletian considered Mithras to be the "protector of the empire". The mysteries of Mithraism were enacted in underground crypts, representing the grotto (symbol of the heavenly vault) where the god had been born from the rock (emblem of the earth). However, the exclusion of women deprived the cult of the popular support that was afforded to the Christian faith. This involvement of the whole family unit laid the foundation of the social system on which the success of the religion ultimately depended. Though in Western Europe the name of Mithras can now only be found buried beneath the churches and in shrines, the name lives on in the branches of Zoroastrianism in Iran and India. 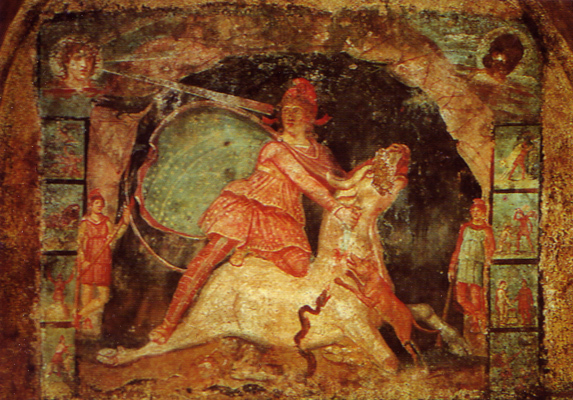 Present-day knowledge helps to provide an astrological explanation for the animals that appear in the paintings and carvings of many Mithraic shrines featuring the sacrifice of the Bull. The Crow. Scorpion. Snake. Lion, and Dog all represent constellations in depictions of the night sky. together with the personifications of the Sun and the Moon. 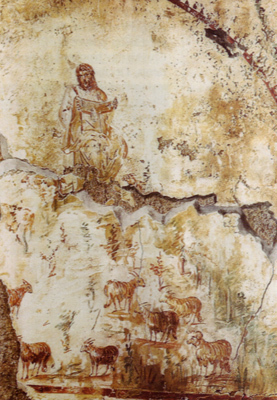 In the fresco pictured here, Mithras is flanked by Cautes and Cautopates, whose torches - symbols of life and death - are raised and lowered respectively. In ad35, shortly after the crucifixion of Jesus, the Emperor Tiberius (ruled ad 14-37) ordered the senate to recognize Christianity. The assembly opposed it, and the senatorial decree prohibiting the cult - non licet esse cbristianos - initiated a campaign of persecution. It was during the reign of Claudius (41-54), that the apostle Peter went to Rome. One of his letters in later years confirmed the decision of Claudius' successor Nero (54-68) to incriminate the Christians for "illicit superstition" prior to the fire in ad64. Flavius Clemens, cousin of the emperor Domitian (81-96), was the first Christian to become consul, but in ad95 he was put to death for being guilty of and Trajan (98-117) tried to find a compromise between the protective policies of his predecessor and the oppressive designs of Domitian. He put a stop to persecution but ordered action to be taken against anyone who. when called before the court, refused to offer sacrifice to the gods. Hadrian (117-138) decreed that Christians should be punished only if they actually broke the law. Under Marcus Aurelius (161-180), the situation was again ambiguous. Montanist heretics, opposed to the belief that Jesus Christ was the Son of God, damaged temples and statues of divinities, but the emperor failed to distinguish between this radical anarchy and the behaviour of the Christian majority. They were accused in general of "outright opposition". The emperor Commodus (180-192) generally assimilated the Christians into the empire. During his rule, for example, underground cemeteries were established. There was keen interest in religious matters at the court of Septimus Severus (193-211), and the obsession of the empress Julia Domna with the cult of the Sun God struck a monotheistic note. There was an image of Jesus in the lararium (a shrine to the spirits protecting a place) of Alexander Severus. Christians now began to participate in political life, and the duty of administering the catacombs was given to organized funeral associations. In the early stages of Christian decorative art. the tone was one of harsh dogmatism, as exemplified in the writings of Tertullian (active between 197 and 220). and symbolism revolved around the concepts of holiness and salvation. 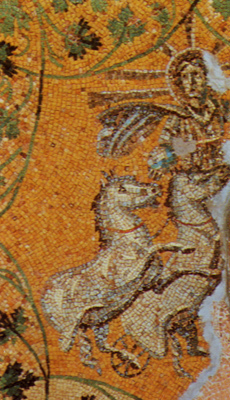 Motifs were based on narrative episodes from the Old and New Testaments. Philip the Arabian (244-249) was arguably the first Christian emperor, and sarcophagi inspired by the new faith are dated to his rule. Images of philosophers and scholars represented the intellectual qualities of the dead, and agricultural and pastoral scenes derived from Virgil were interpreted as a vision of paradise. Gradually, the Hellenistic tradition was abandoned. In sculpture, incorporeal forms were lost in space and shadow, with emphasis instead on the symbolism of a few selected objects. 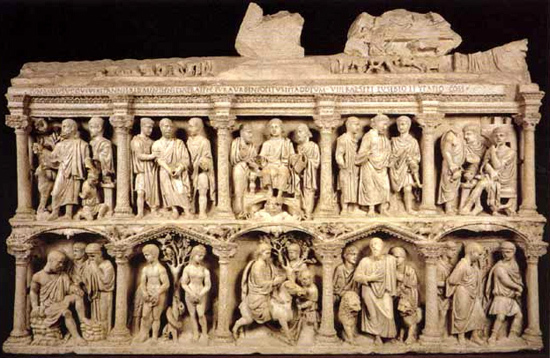 The sarcophagus of the Via Salaria (Museo Pio Cristiano) blends the rustic motif of rams with groups of people reading, two disciples, and the deceased's wife with her servants. 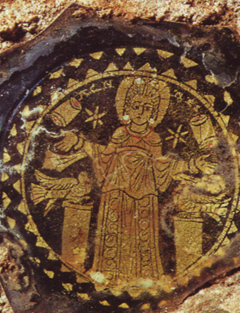 In the centre is the Good Shepherd, allegory of Christ. The increasing power of Christianity troubled its opponents. Decius (249-251) ordered all citizens to worship the gods, and, in an empire scourged by pestilence and famine, Valerian (253-260) renewed general persecution. He issued edicts against the clergy in an attempt to dismantle the entire structure of the Church. Decorative art was influenced by the thinking of some of the individuals who were subjected to persecution: Cyprian of Carthage, bishop and martyr, a moralist who developed the philosophy (based on Lucretius) of a world that had grown old and tired, and Novatian. who initiated theological speculation. The authority of the bishops, recognized by Valerian, provided an excuse for Gallienus (260-268) to revoke the notion of the primacy of the bishop of Rome and establish the jurisdictional rights of individual Christian communities. Christianity was the religio licita ("permitted religion") and Christian officials were relieved of the obligation to worship idols. In painting, the subject of salvation was supplemented by deeper issues. Extreme human conditions were examined in the disobedience of Adam and Eve, the patience of Job, and the dedication of Abraham. The principle of a guiding providence was celebrated in the story of David armed with a sling, Tobias with the fish that restored his father's sight, and Jonah rescued from the belly of the whale and spared to convert the city of Nineveh. The last is the only prophet with whom Christ compares himself and his mission during his sermons (Matthew 12: 39-41). He is depicted as a teacher, as well as a central figure in the ranks of the apostles. Diocletian (284-305) returned to the original belief in the sacred nature of the empire and excluded Christians from the army in ad297. Galerius (305-311) extended Valerian's policy of extermination, destroying churches, burning scriptures, and convicting adherents. In ad306, peace returned to Italy with Maxentius and to the western provinces with Constantine (306-337). who defeated Maxentius in ad312, bearing the monogram of Christ on his soldiers' shields. The following year, he issued the edict of tolerance. The church soon made an impact on cities with its new ceremonial buildings, climaxing with the building of St Peter's basilica (ad3I9-24). Recently, strange signs and symbols testifying to the message of the apostles have come to light. A fragment of papyrus relating to St Mark's Gospel, found in the caves of Qumran, dates from before ad68, and extracts of St Matthew's Gospel (Oxford) date from about ad60. The novel Satyncon contains a satirical account of the facts related by St Mark. The story, set just outside Naples and Pozzuoli, was written by a companion of Nero, Gaius Petronius, who was driven to suicide in ad65 by the hostility of Tigellinus, In the region of Campania other pieces of evidence precede the eruption of Vesuvius in ad79. The "magic square" of Pompeii conceals the words Pater noster, while at Oplontis, outside Naples, there is a reference to the persecution of the Christians in the villa of Nero's wife Poppaea, who died in ad65 In a graffito reading mnesthei Beryllos ("Berillus, take care! "), the letter "Rho" has a horizontal line across it, making it the oldest known chrismon - monogram of Christ - ever found (a letter from Paul in ad63 indicates that there were Christians in court). The writer of the graffiti is warning Nero's secretary that someone is aware of his spiritual leanings and is plotting his downfall. Peter and Paul were buried after their martyrdom in the communal necropolises situated respectively in the Via Cornelia on the Vatican Hill and on the Ostiense. So too were other Christians until the donations of land by adherents of the faith led to the building of coemeteria or "resting places", where the deceased could await resurrection. 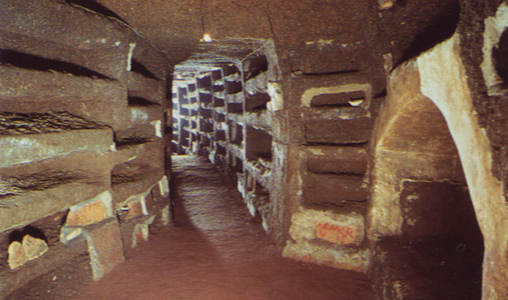 In the Middle Ages, the name "catacombs", derived from a sign under the basilica of San Sebastiano on the Appian Way, was applied to these underground cemeteries. More than 60 such catacombs were built in locations around Rome, each consisting of mile upon mile of galleries in tufa, a form of limestone. Starting from old caves or wells, they descended to a depth of up to five levels. Branching off the galleries were innumerable burial niches (loculi), arched recesses (arcosolia), and chapels to accommodate the more important tombs. In the time of Theodosius, the diggers who carried out the work belonged to an organization and handled the sale of plots. 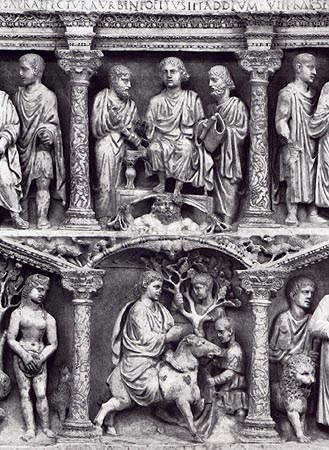 Detail from the Sarcophagus of Junius Bassus. Junius Bassus, prefect of Rome, had recently been converted when he died in ad359. His sarcophagus was a masterpiece of technique and inventiveness. Its subject matter and style spanned two ages, blending elements of both classical and Christian art. The work was arranged on two layers, the lower level with arched sections and the upper with lintels. The entry of Christ into Jerusalem mirrors the arrival of the emperors. The three central scenes of the upper panel are static and solemn, in contrast to the narrative vivacity of the others: this recalls the contrast between the symbolic appearances of the emperor and the depiction of the military activities on the column of Marcus Aurelius. In the centre, the sovereignty of Christ is supported by the personification of Heaven. The arrest of Peter (on the left) is placed on the same footing as that of Jesus (on the right), in consideration of the fact that St Peter's basilica was chosen as the site for the monument. The hand of God appears in the upper left corner to halt Abraham as he prepares to sacrifice his son: the direction of the gesture makes a diagonal line across the sculpted surface, which concludes with Paul being led to his martyrdom, facing outward like Abraham. The two extremes of the other diagonal, however, arrive at the seated, inward-facing figures of Pilate (above), and Job (below). On one side of Christ's entry the Fall of Man is shown, and Daniel in the lions' den is shown on the other. In order to avoid an elitist form of decoration, the burial niches of the catacombs developed an artistic style that was neither technically nor economically demanding. Besides the paintings on the ceilings and walls, the rectangular sepulchres, hemmed in by areas of marble and brick, provided a great opportunity for artistic experimentation. Here, the ideas of the faithful were concentrated within a confined space, surrounded by the natural frame of the tufa. Initially, the space was left undecorated, as was customary in the expectation of the imminent return of Christ. But attention to the deceased persons increased as hope for the reincarnation faded. In some cases, the name of the person was inscribed in the mortar. The illiterate tried to reproduce the evocative and protective value of inscriptions by using sequences of enigmatic signs. Articles buried in the tomb were chosen not so much as comfort for the deceased but as souvenirs of past lives and relationships. In the plaster, items of nostalgia were fixed, such as bracelets, necklaces, dolls, ivory statuettes, and small domestic items such as buttons, pins, and coins. These objects were of no great symbolic significance and had meaning only for the family of the deceased. Catacomb decoration was not the work of a particular school of artists but of individual believers who. by assembling and reconverting humble belongings, managed to express themselves in a spontaneous and intimate way. From a means of giving recognition to anonymous tombs, this custom went on to kindle new styles. The addition of bright materials, shells, pieces of glass, and coloured marbles meant that these subterranean creations came to life in the light of the blazing lanterns.